The Leichter Panzerspähwagen (German: roughly "Light Armoured Reconnaissance Vehicle") were a series of light four-wheel drive armoured cars produced by Nazi Germany from 1935 to 1944. They were developed by Eisenwerk Weserhütte of Bad Oeynhausen. Chassis were built by Auto Union in Zwickau and assembled by F. Schichau of Elbing and Maschinenfabrik Niedersachsen in Hanover-Linden. It used the standard sPkw I Horch 801 (heavy car) chassis with an angled armoured body and turret. The rear mounted engine was a 67 kW (90 hp) Horch 3.5 petrol engine, giving it a road speed of 80 km/h (50 mph) and a cross-country speed of 40 km/h (25 mph). It had a maximum range of 300 km (186 mi). Used by the reconnaissance battalions (Aufklärungs-Abteilung) of the Panzer divisions, the type performed well enough in countries with good road networks, like those in Western Europe. However, on the Eastern Front and North Africa, this class of vehicle was hampered by its relatively poor off-road performance. In those theaters, it gradually found itself replaced in the reconnaissance role by the Sdkfz 250 half-track. 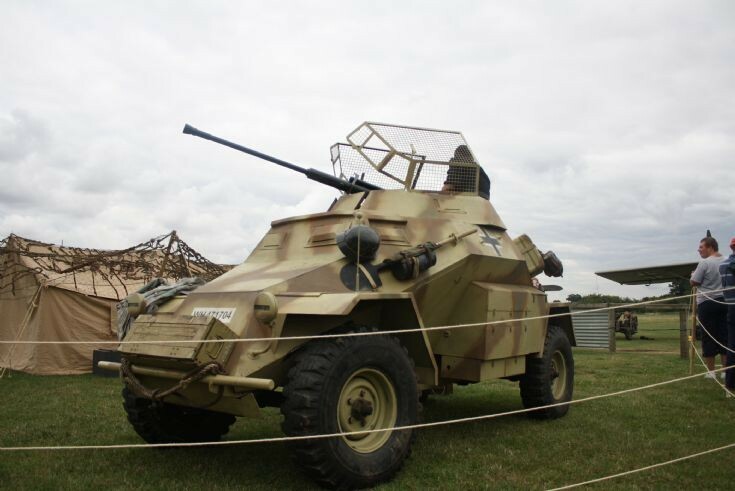 The Sdkfz 250/9 was the Sdkfz 250 with the same turret as the Sdfkz 222. The Sdkfz 222 was examined by Soviet designers before they created the similar BA-64 light armoured car see picture #6411. Front and sides were made of 8 mm (0.3 in) steel; thinner 5 mm (0.2 in) plates protected the top, rear, and bottom. Cast vision ports later replaced ports cut into the armour. The open topped turret was fitted with wire mesh anti-grenade screens.